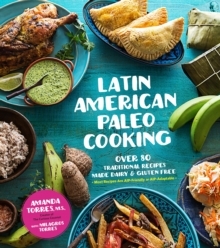 Latin American Paleo Cooking combines exciting, new flavours and unique ingredients that adventurous paleos and foodies will not want to miss out on. With the help of co-author Millie, Amanda's Puerto Rican mother-in-law, Amanda provides authentic recipes inspired by Puerto Rican, Cuban, Haitian and Caribbean flavours. Recipes include Anticuchos (Peruvian Beef Heart Kebabs), Carne Molida (Puerto Rican Seasoned Ground Beef), Chicharrones (Pan-Latin Fried Pork Belly), Mofongo Relleno de Camarones (Puerto Rican Plantain Stuffed with Stewed Shrimp), Carimanolas (Columbian Stuffed Yuca Fritters), Mangu (Dominican Mashed Plantains) and Hojaldre (Puerto Rican Spice Cake), all as flavourful as they are healthy. Amanda has achieved lifechanging success with the Paleo diet, losing 80 pounds in one year. She has 24k Facebook followers and has been featured in Redbook, The Huffington Post, First for Women, Buzzfeed and PopSugar. With Amanda's incredible Paleo recipes, readers can enjoy the flavours of Latin home cooking right in their very own kitchens. Publisher: Page Street Publishing Co.